Do you need garden waste removal in Walthamstow? We have the ideal solution! For more than a decade we’ve been supplying garden clearance Walthamstow householders trust and happily recommend to neighbours, family members and close friends. They really like our prompt, flexible services and budget-friendly prices. And we believe you will too! 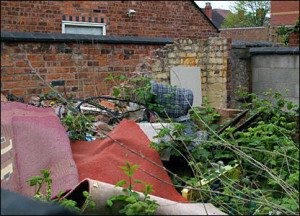 Garden clearance is a time consuming job and garden waste disposal can be a genuine inconvenience. But Away With It garden clearance services couldn’t be more simple. Our skilled and experienced staff will clear all of your garden waste in no time. And at an economical price. Gardening equipment and tools such as forks, hoes, spades etc. as well as electrical items, or those with fuel engines, such as petrol lawnmower, strimmers etc. Garden structures such as sheds, greenhouses, playhouses, paving, fencing etc. We can dismantle these items too. Play equipment from paddling pools through to larger items such as trampolines, sandpits, swings, slides, climbing frames etc. We can also take chemical based substances and liquids, such as plant feed, weed killer, paints (including gloss), varnishes, garden staining products etc. We are registered waste carriers. You can rely upon us to perform an entirely professional job and take care of all your waste safely, securely and legally. We are open for business 7 days a week from 7am to 11.30 pm. Evening and weekend collections can always be scheduled for your convenience. We offer a fast, on demand collection service. Any time you need us we are only a phone call away. Bookings are in two hour slots and we’ll definitely call ahead of time tell you know when we’ll be getting there. We know how annoying it is to be left hanging around! Our simple pricing structure means there won’t be any disagreeable bombshells when the job is concluded. The price we quote is the price you will pay without hidden extras. We always sweep up when we’ve finished clearing your rubbish and leave your garden neat and clean. We’re committed to doing our bit for the environment, so 80% of the waste we remove is recycled. To discuss your requirements for garden clearance Walthamstow call us right away on 0208 504 7390. We’re standing by 7 days a week from 7am to 11.30 pm to take your call. Our experienced staff will be pleased to answer your questions and provide a reasonably priced free estimate. Or you can send your details using our easy request a quote form and we will respond to you fast.